The overwhelming success of The Lord of the Rings trilogy and the Harry Potter series has meant that fantasy is the new big thing – the genre has left behind the failures of Dungeons & Dragons and its ilk. Recent years have delivered screen adaptations of The Chronicles of Narnia: The Lion, the Witch and the Wardrobe, Eragon, The Seeker: The Dark Is Rising and Stardust, and more will follow in 2008. The quality of these films has been patchy, however, whether their box office would suggest that or not, with The Lord of the Rings trilogy still far and away the most successful cinema experience based on fantasy writing. This trend continues with the latest release in the genre – Philip Pullman’s ‘Northern Lights’ remade as The Golden Compass. The Golden Compass is set in a parallel world not dissimilar to our own, where humans have their souls outside their bodies in animal forms known as Dæmons. Their world is linked to many other parallel worlds by the misunderstood power of ‘Dust’. Dakota Blue Richards is Lyra Belacqua, an orphan who lives in a secular/scientific school of high regard, and adores her scientist uncle Lord Asriel (Daniel Craig). After he makes a major breakthrough in his study of Dust, an attempt on Asriel’s life by a representative of the mysterious Magisterium leads to his rebellion and Lyra’s removal from school by Mrs Coulter (Nicole Kidman). Meanwhile, Lyra’s best friend Roger (Ben Walker) is kidnapped by ‘Goblers’, evil-doers who abduct children for unknown purposes. During her subsequent quest to find Roger she will inspire others to join her in what quickly becomes clear is a major battle between righteous free-thinkers and the oppressive Magisterium. The Golden Compass is filled with generally well animated and realised fantastical creatures, from talking polar bears to the varied animals that make up the many characters’ dæmons. As representatives of the souls of their humans, they are playful or violent, sneaky and cruel, and often interact with each other with unexpected effects. The CGI is strong with only occasional moments that don’t quite work – particularly when two dæmons are interacting – and the colours and set design all combine to produce a world similar but differentiated from our own. Its appearance may be its best feature, although the final battle before the ‘to be continued’ ending suffers from too-rapid editing and being set in the polar nighttime – the characters are almost impossible to identify. Dakota Blue Richards is quite charming, and she needs to be as Lyra starts out fairly unlikeable, before finding better qualities as the story progresses. She is surrounded by ‘name’ actors such as Kidman, Craig, Sam Elliott and Christopher Lee, as well as voice acting by others such as Freddie Highmore, Ian McKellen, Ian McShane, Kristin Scott Thomas and Kathy Bates. Unfortunately, none bar Kidman gets adequate time or character development to allow them to make their mark. This may be the greatest problem with The Golden Compass – in its haste to get to the big action scenes and battle sequences, it forgets that the audience needs to care about those fighting (and dying). This may be subsequent to the need to explain so much of the world and its quirks, as the exposition in the opening half overwhelms the character information to the point that each is given rare moments to define themselves before being replaced by another whom we must get to know. Given it runs only 113 minutes – which is a nice change from the trend of making overlong films that just need some editing – it has room for another few minutes to allow a more comfortable pace. While there is potential for an involving story complete with potent allegory to evolve in later films (there are two further books in the ‘His Dark Materials’ trilogy), this first suffers from being forced to define the world and its peoples. 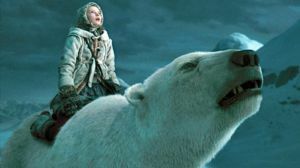 The Golden Compass unfortunately joins the list of fantasy-based film failures, in spite of its massive comparative budget of US$180 million. Rewatch The Lord of the Rings instead. This entry was posted in Film Reviews and tagged Childrens, Fantasy, Steampunk by Mark Lavercombe. Bookmark the permalink. I knew it would be disappointing. I realise it’s bad form to go into a film with pre-conceived notions, but ‘Northern Lights’ was so damn fantastic that I had a feeling the film version couldn’t compete. The book is a stunning, original fantasy that manages to walk that fine line between kids’ book and adult literature. It has some unforgettable moments and a whole bunch of great concepts. Most importantly, it never talks down to its audience, an important aspect of the narrative itself. The Golden Compass, however, starts with one of those awful narrated introductions that attempts to get the audience quickly acquainted with this other world, but is in fact rather confusing and clumsy. From then on the film feels like it’s in fast forward, in a rush to get through everything contained in the book. Plot points feel contrived and characters seem unconvincing as their motivations change all too frequently. As much as I hate long movies, this would have had more chance succeeding if the running time was a half hour longer. Taking some parts out of the story might have helped also, to enable the script to give greater weight to the more important elements. In some ways the film is like Harry Potter and the Philosopher’s Stone (another book/film of which the US publishers felt the need to change the title) – in trying to cover the whole book it comes off as by the numbers rather than the refreshing and challenging film it should be. There are things that Chris Weitz et. al. got right. The dæmons, for example. 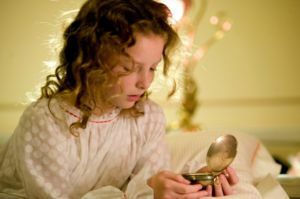 One of the most original and inspired aspects of Phillip Pullman’s novel is the characters’ familiars, effectively the human’s soul (as is hinted in the book and blatantly explained in the film). I imagine a huge portion of the budget was allocated to the dæmon department, and they did a pretty good job. Sure, most of the time the camera doesn’t focus on the animals when they’re talking, but that’s good in a way, since it stops the film from becoming too cutesy. Dakota Blue Richards is good as Lyra Belacqua. As a tough-as-nails, no nonsense young heroine, she’s great, though the film has her jumping from emotion to emotion terribly quickly. It may have been better had we stuck with her through every single scene, rather than the many cut-aways to bit players such as Christopher Lee, Nicole Kidman, Derek Jacobi and their various associates. None of the other high profile names really get a chance to shine, and perhaps the performers are gambling on a long-lived franchise. The voice talent is excellent, however, from the meek (Freddie Highmore as Lyra’s dæmon Pantalaimon) to the mighty (Ian McKellan as ice bear Iorek Byrnison). Overall this is a film that frustrates. If Peter Jackson and Co. could get The Lord of the Rings so right, how come The Golden Compass fails? Perhaps if the screenwriters and studios had more faith in their audience, we wouldn’t have all the information unceremoniously dumped at our feet right at the beginning. The book takes its time colouring this other world, the film simply dumbs things down. Every time the characters refer to the alethiometer, they quickly follow it up with ‘golden compass’ (though tellingly off-camera), and this goes to show just how ‘careful’ people are when 180 million dollars are on the line. Children (and adults for that matter) aren’t stupid, and the fact that almost any ten year old could reel off a list of a dozen types of dinosaurs is testament to the fact that they’d have no problem whatsoever with an alethiometer. As it is, I spent a lot of time ‘filling in’ moments with my memories from ‘Northern Lights’. Fans of the book beware, everyone else trust me when I say that the source material is much, much better.